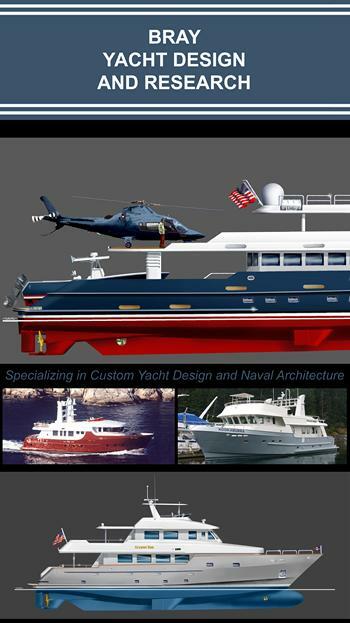 Bray Yacht Design and Research Ltd. is an international award-winning naval architecture company that has been involved in design and consultation work for all types of pleasure vessels, commercial and special purpose vessels. The Company's vessel designs are known to be very fuel efficient, economical to build, seaworthy and comfortable, and their advanced designs are attracting attention from around the world. Bray Yacht Design and Research Ltd. is also involved in research and development, technical studies and reports concerning structures, propulsion, stability, weight and feasibility and operational aspects for all types for marine equipment. Expertise is available to prepare conceptual, preliminary, and complete designs. Facilities include 3D modeling and dedicated equipment for open water testing of model hulls for research and development. 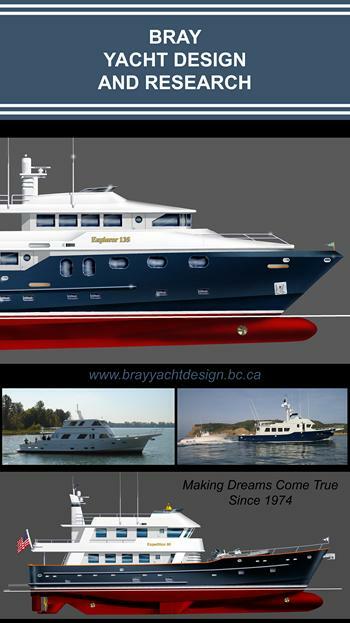 Courtesy of Bray Yacht Design and Research Ltd.
� Copyright 2009 CFB Marine Group. All Rights Reserved.